School floors covered with vinyl and carpet are largely a thing of the past. Finished concrete school floors are being seen more often in schools that range from elementary to college levels. 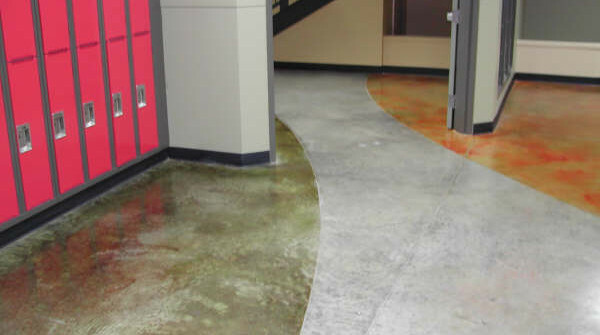 AGC's Resinous concrete coatings are an ideal flooring for most school areas, with few considerations. Concrete floors are durable, have aesthetic potential, and are low maintenance. This makes them ideal for hallways, auditoriums, offices, restrooms and classrooms. Carpet makes classrooms quieter, but it takes too much of a beating to be practical in classroom flooring situations. Instead, consider using carpet on walls to deaden sound, and use concrete on the floors. Colored concrete can be achieved with many different systems and can be protected to offer a long lasting high gloss shine, along with being sturdy under the beating students put on it. If you want a warmer material for students, you can use washable cushions, mats, and rugs on top of colored concrete classroom floors. Anti-fatigue mats, usually made from rubber, will make standing on a concrete floor comfortable for teachers, says Facilities Management. “Shop” or vocational learning classrooms are an excellent place for concrete floors with high performance coatings. Concrete also works well for electrical, janitorial, and utility spaces, where there is heavy use. Rooms like these will demand dust proofing using an epoxy or Polyaspartic as an efficient sealer. New England’s Asthma Regional Council calls concrete flooring a top choice in schools, preferable over vinyl and carpet. Pollutants that are associated with respiratory diseases, like mildew, mold, and dust, are captured and multiply in carpeting and released into classroom air. Vinyl may also become moldy or mildew if water gets below the flooring. Vinyl is toxic, and concrete is simply a safer, healthier choice. AGC's Concrete floors also get high marks for requiring less maintenance. They are higher in durability and they have less of an environmental impact that vinyl or carpet. High performance coatings make concrete even more durable. Officials who work in your schools will weigh the cost of surface prep for concrete against what seems easier – placing resilient tile flooring. However, limiting stripping, buffing, and waxing intervals will save your school a good deal of money over a year and certainly over 10 years. This is one reason why concrete is becoming an increasingly attractive choice to those who decide what type of flooring to use in their schools. They are certainly more familiar with vinyl and carpet, but concrete flooring simply has too many benefits to overlook.